Is The Post-Exercise Anabolic Window a Myth? This study challenges the belief that a specific type or timing of a “recovery meal” is necessary to get the most bang for your buck after a workout. The researchers approach this by reviewing existing literature on the effects of nutrient timing and reanalyzing the results. The most common reason given for eating a “recovery meal” is to replace the glycogen lost during heavy exercise. Glycogen is a type of sugar which our body produces from the food we eat. It is very useful in “explosive,” or short and intense movements, such as jumping, or lifting something heavy. Our muscles can store glycogen within themselves, and can quickly turn it into energy (in the form of ATP) extremely quickly in a process called glycolysis. There is some evidence that glycogen is also a mediator in intracellular signaling, and has an effect on the rate at which muscles are catabolized (reabsorbed to fuel the body). When carbohydrates are consumed immediately post exercise, muscle glycogen is replenished twice as effectively as when the athletes waited to eat for 2 hours. Consuming protein and carbohydrates together enhances glycogen resynthesis, or the process of muscles “filling up” with fuel again. Aragon and Schoenfield’s thoughts on the matter are that there is not a significant amount of evidence supporting the “anabolic threshold.” Studies have, in their minds, proven that there are very select cases where the timing of eating will affect importance, such as endurance events (long enough to deplete glycogen, generally over 2 hours in duration) that are less than 8 hours apart, or those who train the same muscles more than once a day. However, there is no evidence that there is any urgency for refueling for the majority of athletes and casual exercisers. As mentioned in the previous section, muscle catabolism is directly affected by insulin levels, which are almost entirely controlled by ingested carbohydrates. One of the arguments for the importance of eating directly after exercise it to prevent muscle loss. However, science, at this time, does not fully understand the control insulin has on catabolism. Aragon and Schoenfield point to several studies that prove spiking insulin directly after a resistance training workout has trivial benefits, if any, unless the athlete is in a fasted state prior to the workout beginning. Thus, the utility of acute studies is limited to providing clues and generating hypotheses regarding hypertrophic adaptations; any attempt to extrapolate findings from such data to changes in lean body mass is speculative, at best. At this point, honestly, you can feel the authors’ blood pressure rising. Throughout the article, they have presented the findings of various studies, and then addressed how the studies were, essentially, worthless, or at least overvalued. Essentially, there was no conclusive evidence of significant muscle volume changes in between groups. According to Aragon and Schoenfield’s article, there is no conclusive evidence that the anabolic window exists in any significant way except for those most extreme competitive athletes. Their suggestion to the majority of the population is to instead focus on all around nutrition throughout the day and week. 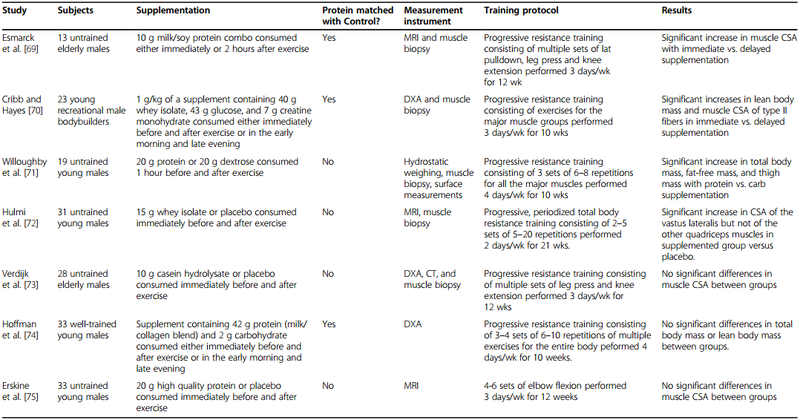 There is some evidence that the preworkout meal is more important, but the studies for that theory are no more thorough than those outlined in this paper. Need a kick in the pants? Who is this study about? This study is one of the few that objectively measures the effect of caloric timing for females with metabolic syndrome. The syndrome isn’t uncommon–as of 2010 over 34% of adult Americans have it. This study’s aim was to show if there was any notable relationship between blood sugar and circadian rhythm, also known as your “brain clock”, which would affect weight loss. What type of people were excluded from the study? Had diabetes, or any abnormal internal organ function. Were taking any type of medication that affects glucose, insulin, reproductive hormones. That doesn’t mean that the study cannot be applied to those types of individuals, but it should be kept in mind that, as with any dietary change, results may vary. BF – This group received most of their calories at breakfast (700 calories), less at lunch (500 calories), and not much more than a snack at dinner (200 calories). DF – This group received a snack at breakfast (200 calories), a small meal at lunch (500 calories), and most of their calories at dinner (700 calories). The women reported their meal intake from home with instructions to make note of everything they ate. Their hunger, or appetite scores, were assessed before and 30 minutes, one hour, two hours, and three hours after each meal by marking somewhere between 0 and 100 on a vertical scale. A dietitian met with each woman twice a week. Weight, blood pressure, and waist circumference were recorded every 2 weeks by the same person. The women reported their meals from home. This is a pretty big problem to me, as it’s not uncommon for people to believe that “just a bite” isn’t worth recording. 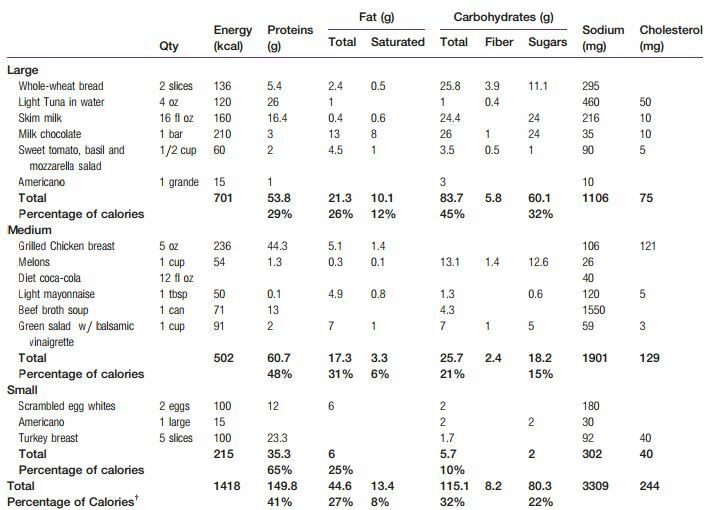 Also, participants were asked to adhere to a specific macro breakdown (fat, protein, carbohydrates), which is another challenge to record. Participants were only withdrawn from the study if they exceeded their calorie goal (1540 calories or more) over 42% of the time, or over 3 days a week on average. Activity levels were not recorded–participants were simply asked to stay at the same activity level they had been at beforehand, which was sedentary. They were only asked to note any change in activity level ever 2 weeks. I’m not sure if I agree with this, as “sedentary” can mean many things. Often times when calories are reduced, you move even less than normal–not fidgeting, needing more motivation to get up to grab a cup of coffee, etc. I would have been happier with this study if participants at least wore a pedometer. Finally, what you’ve been waiting for! The women who ate their biggest meal first (BF) ended the study with a 10% drop in body weight. The women who ate their biggest meal at dinner had a 5% drop. The BF group also had a more significant drop in waist size, as well as their fasting glucose and insulin. This study does suggest that breakfast is, in fact, the most important meal of the day, for those who eat the Standard American Diet, which is low fat, high carbohydrate, moderate protein. What I’d love to see is another study that follows the same principle of eating calories early in the day, but with a ketosis-inducing macro nutrient breakdown. After reading this study in its entirety, I’m not convinced that it’s the calories that affect weight loss as much as it is the timing of carbohydrate intake, or blood sugar spiking foods. Hello World, And How Are You? Hello all. My name is Becca, and this blog is going to be my…thing. I have a degree in advertising, but in my free time, I like to play nutritionist and science writer. Occasional keto/paleo evangelistic posts. If you don’t agree with these life styles please just keep scrolling, I can’t help myself, really. I just want to say right now that I do not have any degree or certification. All advice you find here should be taken as from a friend, not a doctor. As far as feedback, please feel free to comment! I love discussing this stuff, and if I post anything that you find confusing or offensive or amazingly inspired, please let me know!